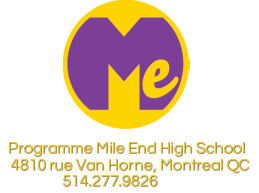 ﻿ Mile End is an alternative high school for students from around Montreal that have had some form of difficulty in regular schools. We often do activities that involve and engage all the students to help make their learning experience a better one. We ﻿offer a variety of ways for students to reengage with school. We work with students to help them get back on track academically in order to either obtain a Secondary School Diploma leading to further studies in CEGEP or to pursue vocational training. We also offer opportunities for students to explore a variety of career options and to gain hands-on experience in a work environment while meeting specific educational requirements. Fundamentally, we believe that the measure of success should be different for each student.